Here is the second of my Valentine's Day breakfast-in-bed recipes. These are a delicious and unexpected addition to a brunch or a wonderful side dish for any meal! We like these more than traditional breakfast potatoes. They are rustic because we scrubbed them and left the skin on but you can feel free to peel them if you prefer. The recipe can be adapted for however many people you are serving. You could also very easily add fresh herbs if you have them. 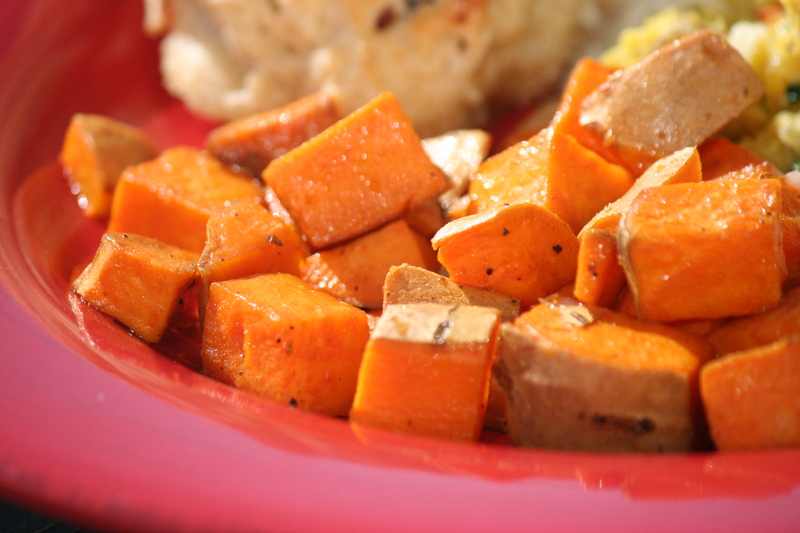 Thoroughly scrub the sweet potatoes and then dice them and put the in a bowl. Combine olive oil and butter and pour on the cut potatoes and toss to thoroughly coat (I used about 4 Tb. total for 4 large potatoes). Season generously with seasoned salt and lightly with fresh ground pepper. Pour potatoes in a jelly roll pan or stone (jelly roll pans have about a 1 inch side). Bake for 15-25 minutes until tender and starting to carmelize/brown (I actually put mine back in the oven after the picture because I realized I wanted them done a little more). Stir every 5-10 minutes. Is that a really big potato, or a really big person? ;) Love the recipes!